Crafts are always fun family activity. You can set the kids working on these crafts to free you up while you are cooking or better yet, you can do these crafts as a fun activity for the whole family to work on in down time. 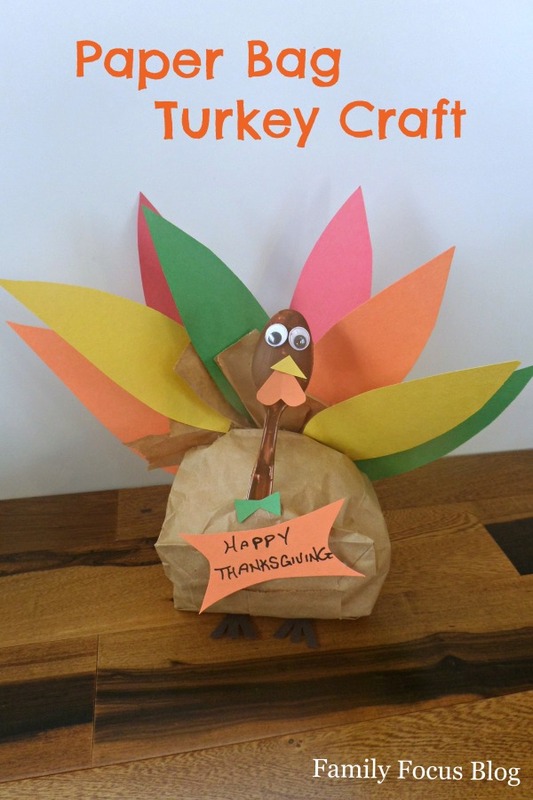 Thanksgiving crafts for kids are an opportunity to make some extra meaningful crafts and to talk about what your are grateful for while you work. 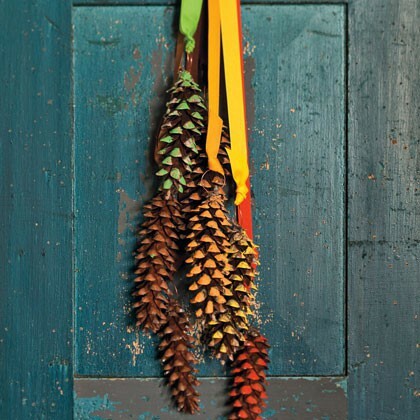 Here is another fun pinecone craft for your front door from familyfun.go.com. Very easy and very pretty for the whole fall/winter season. 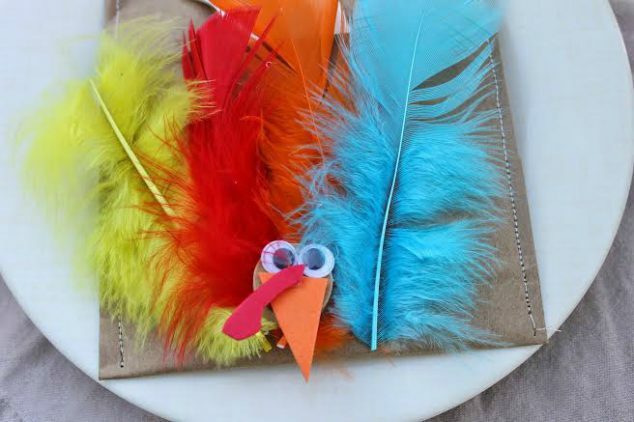 This thanksgiving craft- Thankful Turkeys- is really fun for kids and very meaningful as you each write something to be thankful for. 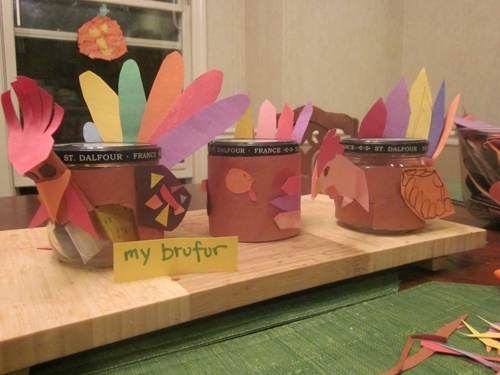 It is an eco-friendly Thanksgiving craft since you can use materials from your recycling bin to make the turkeys. Then have the kids fill out what they are thankful for on slips and put them inside the jars to read on Thanksgiving day. This are cute little turkey decorations for the Thanksgiving centerpiece or the mantle or just a fun project to keep the kids busy. Find instructions here. This is such a cute and useful craft. You can find the instructions for the turkey utensil holders here. 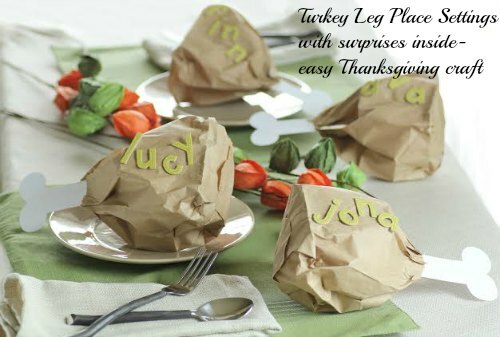 These turkey drumstick place settings are the perfect way to label your guest seats! Your kids will enjoy this and they are a useful craft as well. Directions here. This fun turkey craft uses paper scraps and leaves to make an eco-friendly paper turkey craft for wall decor. Instructions here. You can get even more ideas for Thanksgiving Crafts on my Thanksgiving Pinterest Board. Enjoy! 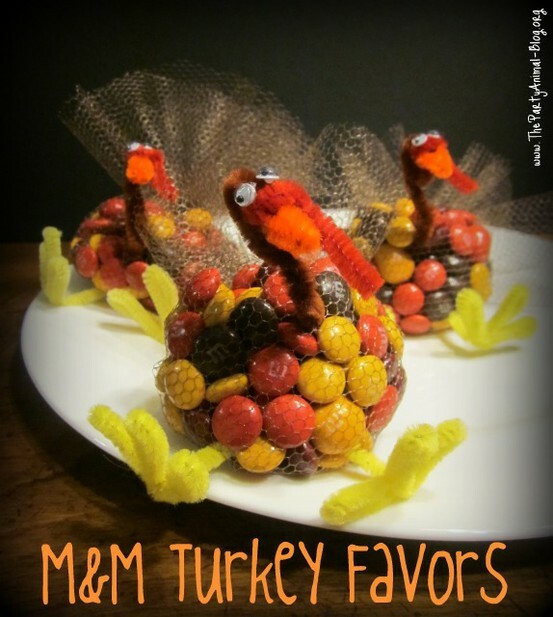 Ooooh – I am totally making those M&M turkey favors this year. I host and I am always looking for something to spruce up the table other than the cornucopia centerpiece that I put out. And I love that my kids can work on these with me!!! OMG! I love your blog design! And I am always looking for new craft ideas (I am so not creative!) and my little one is loving pine ‘tones’ as he calls them, thanks so much for sharing! So great to see another Circle of Moms new friend! 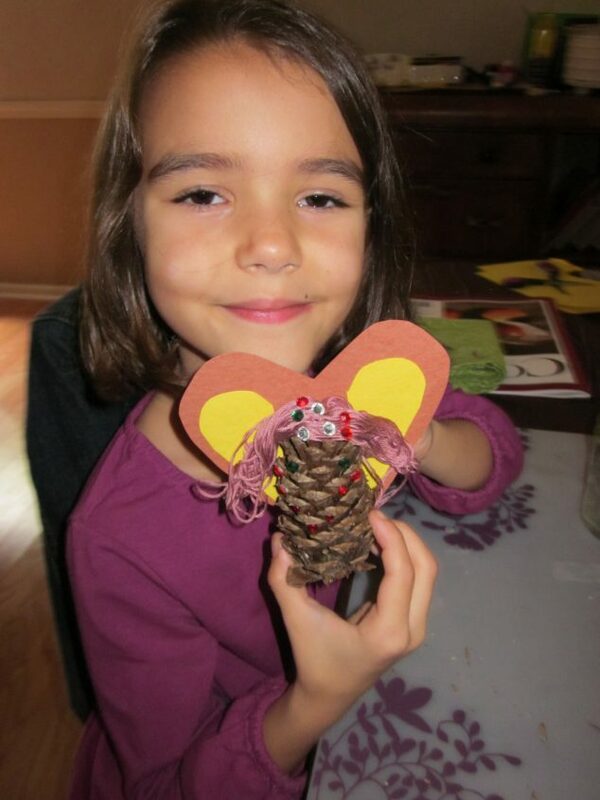 Thanks for all these cute Thanksgiving craft ideas! I love the pine cone crafts and the turkey crafts. Very nice ideas. I will go check out your Thanksgiving crafts on Pinterest right now!